It's a U-shaped space, with the bar in the centre. The walls are mainly exposed brick, but a couple of feature walls are hung with floral wallpaper. The floor is bare boards, and seating a mix of upright wooden chairs, padded banquettes, and church pews. Flowers in small vases sit on the tables. One arm of the "U" is home to a small book swap space, and the other has a piano. Kake visited on a Monday lunchtime in November 2017. There were already half a dozen other customers when I arrived just after noon, though this was mainly one group of parents and children, all of whom departed around an hour later. Music was playing, on the funky side, not too loud. Two of the four handpumps were clipped, for Brockley Brewery Red Ale and Laine's Bestest Bitter. A pint of lime and soda was £1.40 and came with two wedges of browning-at-the-edges lime. Service was friendly, welcoming, and helpful. As of November 2017, food is served noon-10pm Mon-Fri, 11am-10pm Sat, and noon-8pm Sun photo of menu. Kake tried the halloumi and red pepper hummus sandwich (£6) photo, which came on toasted granary bread by default. The hummus seemed to be home-made; it was a bit bland, but the halloumi made up for that. The salad on the side was dressed with oil and vinegar, and generally seemed fresh aside from one small wilted leaf. Signs seen in November 2017 indicated a quiz on Wednesdays and live music on Saturdays. They have WiFi, with the access code printed on the menus and available from staff, but on our visit it was quite laggy. According to their website as of November 2017, they are dog friendly. Child-friendliness: According to their website as of November 2017, children are welcome until 8pm. There seemed to be some sort of parent-and-baby meetup going on during our visit. Several of the menu options are available as children's portions, including vegetarian and vegan options. The accessible toilet has baby change facilities. Accessibility: Two steps at the front entrance. Two smaller ones (but two sets of doors instead of one) at the side entrance. Once you're in, it's step-free to the toilets, including an accessible one. Last visited by Kake, November 2017. 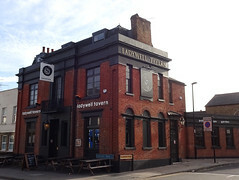 Opening hours taken from the Ladywell Tavern website, November 2017. Last edited 2017-11-18 08:49:16 (version 16; diff). List all versions. Page last edited 2017-11-18 08:49:16 (version 16).